Classes at Sierra Saddlery School cover the many fine details necessary to be proficient at saddle making. Not all saddles are created equal and neither are saddle schools. While there have been improvements and changes in the design of the modern day saddle, there is still something to be said about building them the old fashioned way, no short cuts, no skimping on leather or hardware and fine craftsmanship. At Sierra Saddlery School, our students receive detailed instruction, and no matter which class you choose, you’ll leave with a thorough understanding of how to build quality saddles. 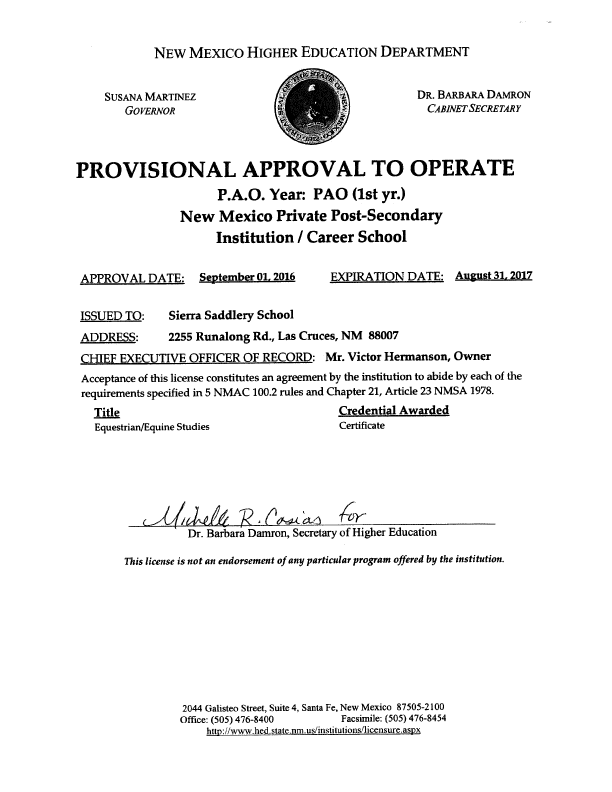 So if you want to learn saddlery as a hobby or become a full time saddle maker and start your own business, Sierra Saddlery School has a class just right for you. Terminology, usage and differences of saddle, harness, shearling and other leathers. Tanner methods and chemicals. Hide properties, grades, weights, sizes and finishes. Weight conversion to square footage. Leather cleaning, care and storage. Saddle hardware, usage, types, sizes, finishes, quality and placement of rigging plates, dees, rings, buckles, rivets, tacks and nails. Synthetic and natural products for seat padding. Properties and usage of glues, dyes and finishers. Leather hand tools. Categories, types, sizes, quality and usage of awls, bevelers, edgers, compass knives, groovers, hammers, mallets, markers, dividers, nippers, pliers, punches, rub sticks, shears, skivers, stamping and swivel knives. Care of tools and sharpening techniques. Safe handling emphasized. Tools that can be made of wood, bone or metal. Anvil or metal block for rivet and burr work. Machinery for stitching, splitting, and buffing leather. Manufacturers models and differences. Needles, awls and thread. Kinds of thread, weights and twists. Thread wax (hot or cold), thinners and lubricants. Machinery maintenance and adjustments. Safety rules. Setting-up for stitching. Practice time and stitching of finished saddle parts on machines. Basic leather shop furnishings. Measurements for work, cutting, stamping, oiling, gluing, tables and benches for work efficiency and comfort. Drawdown strap patterns for pull-down horse. Stamp stone thickness and qualities. Patterns. Design and make basic patterns and variations. Pattern adjustments. Match pattern pieces for design flow. Saddle tree preparation. Truing center points and lines. Checking and composition for warpage. Layout techniques for cutting skirting and other leathers for strength, stretch, or give and minimum wastage of hide/side. Saddle tree measurement technique for truing and compensation. Placement and installation of rigging (single or double), center fire, 5/8, 3/4, 7/8 or full double. Saddle construction, applying all the techniques taught for cutting, fitting, skiving, shaping, smoothing, adjusting, blocking, plugging, hand and machine stitching. Welts, hoods, binding or Cheyenne roll, leather-ground stirrups. Leather ground seat. Complete saddle ready-to-ride. Bulk reduction, edge finishing, stress point reinforcement. Leather carving and stamping. Instruction in flow line and free form drawing, design balance, symmetry to saddle parts, optical illusions. Short cuts and crutches for the non-artistic person. Layout and transfer. Skill development using swivel knife and stamp tools. Introduction, practice and application to saddle of traditional and classical saddle basket weave, border, corner, floral or half-breed patterns. Sources for all materials, supplies, tools and machinery. Estimation and conversion. Retail pricing of custom leather products. Mark-up methods. Profit margins. Start-up inventory, tools and machinery. Product liability. Shop policies. Showing your workmanship and how to get top dollar. Overview of the horse’s back and internal organs. Relationship between the horse, saddle and rider. The horse, saddle and rider in motion. Interaction of the saddle bars, fork, gullet, stirrup length, rigging placement, seat width and slope for riding balance. Evaluation of the rider’s weight, hip and buttocks, leg length and level of riding ability for the custom-fitted seat. Blending type, size, and style of saddletrees and parts of the custom saddle for function, safety, strength and aesthetic quality. Recognizing horse-saddle-rider fitting problems and knowing where and how to correct it. 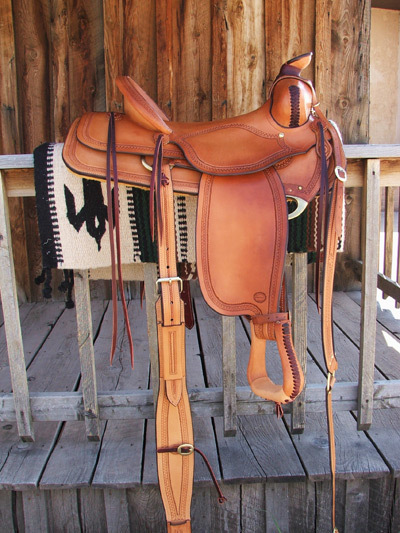 Anomaly of western saddles for equestrian events – pleasure, trail, show, stock horse, cutting, penning, roping parade, ranch work, cross-country or packing. Pride and satisfaction in professional-quality American craftsmanship. At Sierra Saddlery School, our students receive detailed instruction, and no matter which class you choose, you’ll leave with a thorough understanding of how to build quality saddles.